If you’re looking for a relaxed, romantic holiday where everything is included in the price, one of our favourites is the Secrets Royal Beach hotel. This adults-only resort is set on one of Dominican Republic’s most beautiful beaches and offers Unlimited Luxury® all-inclusive accommodation alongside the paradise setting. This is a fantastic resort if you’re looking to sunbathe or go for a swim. We love the large pool and convenient access to the palm-lined white sand beach. Every room features a Jacuzzi too – a very nice touch. If you want to get more active, Secrets Royal Beach has recently added a number of entertainments and activities including an on-site casino, non-motorised watersports and dance lessons. Top Tip: The resort offers a dine around service with its sister resort, Now Larimar Punta Cana, giving you a total of 14 dining options. 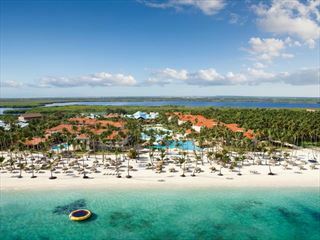 Resting on a gorgeous white sand beach in Punta Cana, this beautiful resort offering the much-loved Caribbean setting of swaying palms, sugary white beaches, and plenty of water sports in the turquoise Caribbean Sea. Preferred club upgrade options also available for a VIP stay with private beach, pool, hydro tub and lounge areas, fine dining, upgraded room amenities and a personalised service. 6 Bars available all open from 10am, latest close 12am OR an option of 11 bars at Larimar Punta Cana, latest close 1:30am at the eclipse night club. Mobile app to view all the events, activities and restaurants at the resort and to learn about your surroundings including any key excursions etc. Sorry, there are currently no prices available for your selected options. Please change your options or call us on 01342310585 for a quotation. The stunning and sprawling Barcelo Bavaro Palace is an elegant seafront resort on one of the Dominican Republic’s loveliest private white sand beaches. 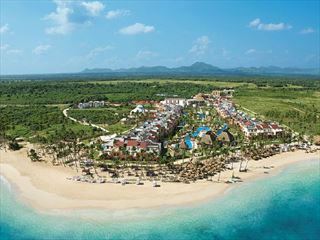 Breathless Punta Cana Resort & Spa is an Unlimited Luxury resort offering beachside relaxation and beautiful surrounds. This adults-only property is ideal for couples looking for a romantic escape in the sun, boasting indulgent amenities and fun activities in the Uvero Alto region of Punta Cana. Dreams Palm Beach is located on the east coast of the Dominican Republic. It’s a friendly, utterly relaxing world comprised of gorgeous beaches and a majestic turquoise sea. Dreams Palm Beach is an idyllic haven for singles, couples and families.